Sorry for the lack of blogs recently – the usual February madness is upon us. It’s the same every year and we try to avoid it as much as possible with horses being ahead of their work in December and January so we don’t get caught out by the weather now. We have a great team of people which makes everything work despite the hectic schedule, and I’m very grateful to everyone for all that they are doing. We have been out and about cross country schooling, show jumping and doing lots of practice in a dressage arena at home. Winter has been kind to us which means we’ve had plenty of opportunities to get out cross country schooling on grass at Swalcliffe and Wayfarer and at Lyneham Heath on their loops – we are lucky to have such great venues within easy. 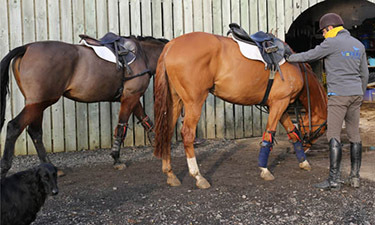 Each horse has its own personal fitness plan. I like to cross train them and use a range of different fitness tools, be it the gallops, hill work (both trotting slowly up hills or cantering up steep hills on grass), swimming, water treadmill – each horse has different needs. It’s less than three weeks until the start of the season and I’m looking forward to getting out and about, as are Megan, Georgie and Jaya on their horses and Noor who is based with me on hers.